Are you interested in a career that is associated with digital marketing? If yes, then, here is your chance. The digital marketing industry in India is undergoing at an unprecedented growth. Just as the IT industry was rising and booming in early 90’s or late 2000 same is the case with digital marketing today. Prime Minister of India, Narendra Modi announced that by 2020 there would be more than 18 lakh jobs available for fresh graduates on digital front. Plus, during the launch of Digital India week many industries joined hands with the government to make the Digital India possible. According to Google, India will cross 500 million internet users by 2017. Also, as per reports, India has about 110 million Facebook users. The e-commerce revenue of India is growing at an annual rate of 51%, which is the highest in the world according to a research by ASSOCHAM-Forrester. The wave associated with the digital marketing is so strong that this is probably the best time to be a part of this ever growing industry with bigger budgets, more and more job opportunities and higher pay. 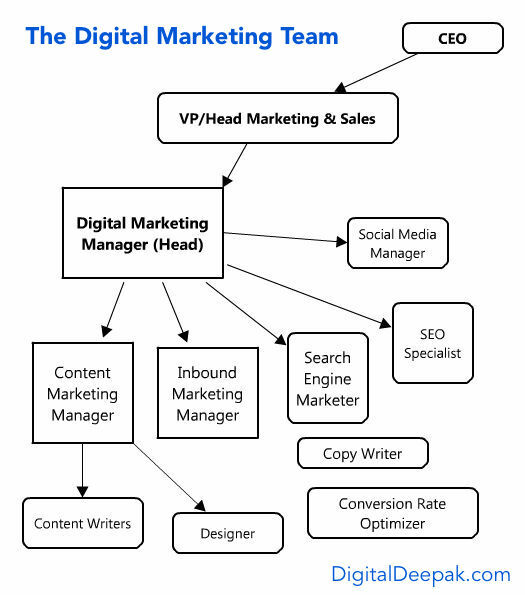 First, let’s look at the hierarchy of a typical digital marketing team in an organization. The positions, structure and hierarchy may differ in different organizations based on the size, structure, revenue and many other aspects. Digital Marketing Manager: As the title says, you would be the one leading the entire Digital Marketing team. You would be reporting to the head of sales and marketing who is responsible for the entire sales and marketing of the company. If you have 5+ years of experience in the profile of digital marketing and projects to prove your worth, you would be easily acceptable. As a digital marketing manager you can expect a salary between 15-20 lakhs INR per annum. Having said that, the salary also varies from company to company, it can go as high as 40 lakhs INR per annum in big companies to as low as 8 lakhs INR per annum in small start-ups. At this position, you will be directly contributing to strategic as well as tactical plans for the organisation and look after all the ups and downs in the digital marketing front. Content Marketing Manager: Very rightly said, “Content is the king.” As a content marketing manager you would be responsible for all the content marketing initiatives to drive traffic, engagement, leads, that deliver sales and customer retention. You would be required to have a mindset to create a content that the audience is looking for, sharing the content on the channels they use and measuring the results of the content marketing activities. If you have 3+ years of experience in this domain then there is ample number of opportunities present. You may be handling a team of content writers or a solo contributor (depends from organization to organization). The annual salary of a content marketing manager may be from 8 lakhs INR per annum to 12 lakhs INR per annum. Again, depending on the size and structure of the company the salary may differ. Inbound Marketing Manager: In order to have a fast growth there needs to be an increase in paid programs as well as inbound programs including SEO, social media and content marketing. As an inbound marketing manager, you need to have a strong social media presence, good analytical knowledge, understanding of content marketing and SEO. Your motto should not be just to produce good content but also to generate ideas and revenues. Some organization requires inbound marketing managers and some do not. In some companies the content marketing managers or social media managers act as an inbound marketing expert. 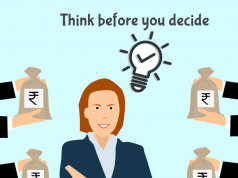 The salary varies from organization to organization but an average salary of 5 lakhs INR per annum is what you can expect. 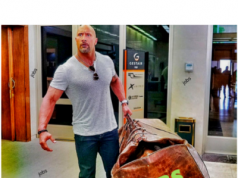 Social Media Marketing Expert: As a social media expert, you need to have an excellent catch of the social media platforms. You will be required to build social media strategies through competitive research, determination of social media, bench marking, messaging and potential audience identification. Continuously work on ideas and methods to improve audience engagement and adopt best practices to boost website traffic. You need to have at least 2+ years of relevant experience. Search Engine Specialist: It is one of the most important aspect of digital marketing. The main job of the search engine specialist is to bring a large number of leads and clicks from a given marketing budget. The requirement of search engine specialist differs from company to company. Some, small companies may not require this position as the digital marketing manager takes care of the responsibilities whereas in bigger companies there is a dedicated search engine specialist. The work experience also varies, differs from zero years to 4 years of experience based on the size of the company. SEO (Search Engine Optimization) Executive: The main responsibility as an SEO executive would be to make your website show up at the top of the search engine results. You need to know the use of keyword or phrases that increases traffic to the site. Mostly, the SEO executives are individual contributors and the experience required differs from 0 to 3 years. Salary is entirely based on the experience. Conversion Rate Optimizer: The main job would be to increase the conversion ratio. Co-ordination is something that you need to excel in as a CRO expert. You would need to work with inbound marketing manager, content marketing manager, SEO experts in various aspects. You need to have 2 to 3 years of hands-on experience to be a CRO expert. Copywriter: You would be responsible for creating content for almost everything. You would be working closely with the entire team to produce better content. May be help the team in various aspects like producing better ad copies, posting better words on the social media or refining the content for better audience engagement. Again, the role can vary from company to company. Some, companies have dedicated copywriters some do not. You can be a fresher or someone with 2 to 3 years of experience and the salary would be totally based on that. The digital marketing space is growing at a very fast pace and the opportunities associated with it are boundless. This is the best time to be a part of this industry to have a promising career tomorrow. Hello Sir, I am a learner in Digital Marketing & read your blog I understand the scope & career growth in Digital Marketing. is spoken english necessay in digital markeitng course. Your communication medium, especially in digital marketing, remains largely English – so you need to be well-versed in it. A lot of people ask how to get a good digital marketing job and is it best career option? This is the best article to get an answer. digital marketing is a really good career option to choose. It is not only an ever-growing field, but it also helps towards a sustainable career growth. Thank you for such a brilliant article.